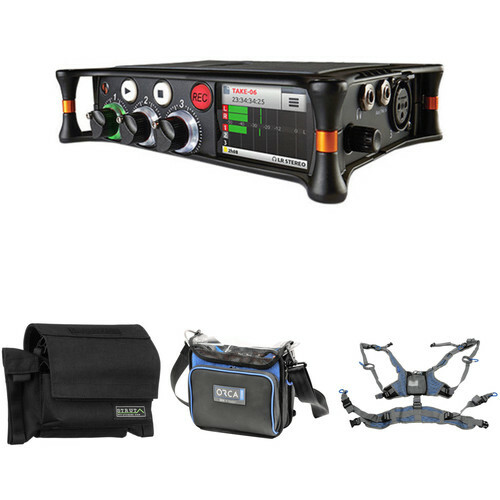 The Sound Devices MixPre-3 Audio Recorder/Mixer with Case, Bag, and Harness Kit from B&H includes the Sound Devices MixPre-3 audio recorder/mixer and USB audio interface, a Strut STR-MP3 custom-fit field case, an ORCA OR-270 sound bag and carrying strap, and an ORCA audio bag harness. An MX-4AA battery sled, a Y-cable (2 x USB Type-A to 1 x USB Type-C), an anti-rotation pin, and an Allen wrench are also included. This kit can be used in production audio mixing and recording for film, broadcast TV, and live applications on set and in the field. The MixPre-3 Audio Recorder/Mixer and USB Audio Interface from Sound Devices is a high-resolution audio recorder with integrated USB audio streaming combined with durability that offers high-quality sound for professionals. It can be used by musicians, sound designers, podcasters, videographers, YouTubers, and field recordists in various audio applications. The MixPre-3 features Sound Devices' Kashmir ultra-low-noise, discrete, and Class-A microphone preamp. Built with 32-bit A-to-D converters, the MixPre-3 ensures audio recordings surpass those of off-the-shelf, IC-based mic preamps. The unit can function as a USB audio interface and record audio to an SD card while simultaneously streaming multiple channels of audio via USB. Furthermore, the sunlight-readable color LCD of the MixPre-3 provides convenient navigation. It is constructed with a die-cast aluminum chassis, is lightweight, and has a robust build. Plus, it is compact and will fit in your pocket, which makes it well suited for jobs on the run. Finally, with intuitive operations and advanced mixing capabilities such as ergonomic gain-control knobs, pan and soloing, timecode input jacks, 1/4"-20 mounting capacity, 1/8" headphone monitoring, and the AA battery/Sony L-Mount lithium-ion battery powering options, the MixPre-3 is sure to meet all your audio-application needs. The MixPre-3 is a lightweight, high-resolution audio recorder with integrated USB audio streaming and offers professional sound quality combined with durability that is suitable for musicians, sound designers, podcasters, and videographers. Featuring handcrafted, high-performance, ultra-low-noise, discrete, Class-A Kashmir microphone preamps, the MixPre-3 has a -130 dBV noise floor, analog limiters, and 32-bit A-to-D converters. These features ensure quality audio recordings. The MixPre-3 makes for a versatile USB audio interface, offering the unique ability to record audio to an SD card while simultaneously streaming multiple channels of audio via USB. It is handy for interviews, podcasts, or simply as a backup recorder to your computer, and the MixPre-3 can be used for Skype or Facetime interviews and to record audio for podcasts or video blogs. The small stature and design of the MixPre-3 will fit most production environments. It features a touchscreen for simple and intuitive operation and a sunlight-readable color LCD for convenient navigation. Constructed with a die-cast aluminum chassis, it is both lightweight and robust. The MixPre-3 is compact, so much so that it can fit in your pocket, and it's ideal for jobs on the run. The MixPre-3 bridges the gap between sound engineers, musicians, and YouTubers with user-friendly navigation featuring Basic and Advanced modes. It is designed to allow a user to start recording right out of the box. The MixPre-3's pre-roll feature captures five seconds of audio before the record button is pressed, ensuring the capture of crucial audio even when the operator can't start recording fast enough. With a full-featured mixer, the MixPre-3 offers ergonomic gain-control knobs for fast and accurate mixing. Other key features include pan, polarity inversion, and soloing plus easy-to-see ring LED metering per channel. It also includes a 3.5mm jack for headphone monitoring with user-programmable presets from its wide-bandwidth headphone amp. As an added benefit to DSLR users, the MixPre-3 has a retractable 1/4"-20 mounting thread, making it a good match for a wide variety of cameras. This design allows for solid, low-profile tripod/camera mounting; because the male and female 1/4"-20 threads are captive, they cannot be lost and are always available. Capable cameras can feed timecode to the device over its HDMI input, which provides synchronization of sound and video. Timecode can also be fed into the unit's 3.5mm input from an external TC generator. The MixPre-3's HDMI input can also receive "record triggers" from popular cameras, which automatically start and stop recording via the camera's record button. The MixPre-3 has multiple powering options. It can receive power from AA batteries in a convenient detachable sled of either four or eight cells. Also available is a sled that offers powering from up to two hot-swappable, Sony L-Mount lithium-ion batteries. Additionally, the entire recorder can be powered from a laptop's USB Type-C or USB Type-A connectors, offering convenient connection and powering with just one cable. For applications where AC power is available, Sound Devices offers an optional AC adapter as well. Sound Devices Wingman, which is a free downloadable app for iOS/Android devices, communicates with your MixPre-3 (running the Musician plug-in) via Bluetooth Smart to give users touchscreen access to high-resolution meters, record/stop/play operations, track naming/arming, and more. The STR-MP3 Custom-Fit Field Case for Sound Devices MixPre-3, from Strut, is a small-footprint, lightweight protective case that can be used for easy access to all MixPre-3 features. It has a removable rain top with a clear vinyl window that can also function as a sunshade or double as a travel cover. In addition to the padded main compartment, the front padded pocket has eight clip-on points for wireless receivers, and is built to hold up to four wireless Sennheiser G3 or similar-sized receivers. This case can accommodate 4 and 8 x AA sleds, all L-Series sled options, plus NP-1, Remote Audio, and various USB-C type power options. The case features belt loop and harness attachment points for most audio harness systems, and includes an HAR-2 audio harness. The ORCA Audio Bag Harness is a ventilated harness to help distribute the weight while carrying an audio mixer. An internal cable and pouch for a battery or power bank are built-in to the harness. The harness features aluminum buckles for connection to any Orca audio bag and can be adapted for different users. The EVA skeleton and mesh fabric allows for ventilation. Box Dimensions (LxWxH) 10.4 x 7.5 x 4.2"
Box Dimensions (LxWxH) 11.0 x 5.6 x 5.05"
Box Dimensions (LxWxH) 12.2 x 8.2 x 4.3"